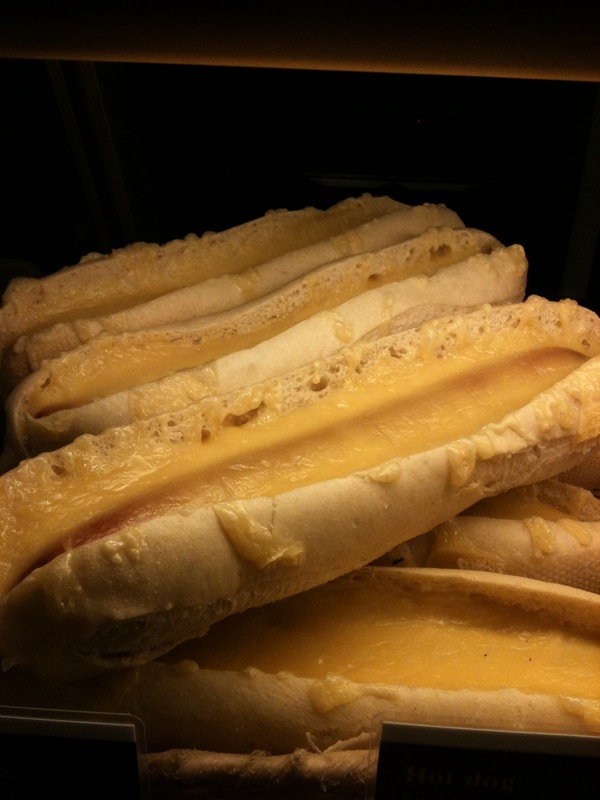 In the midst of that bun is a hot dog, this was at a fast food place at the Prague Train station – something about the excess of all that cheese on white bread with a hot dog buried deep inside fascinated, repulsed and well, appealed to me….but I opted for coffee instead. 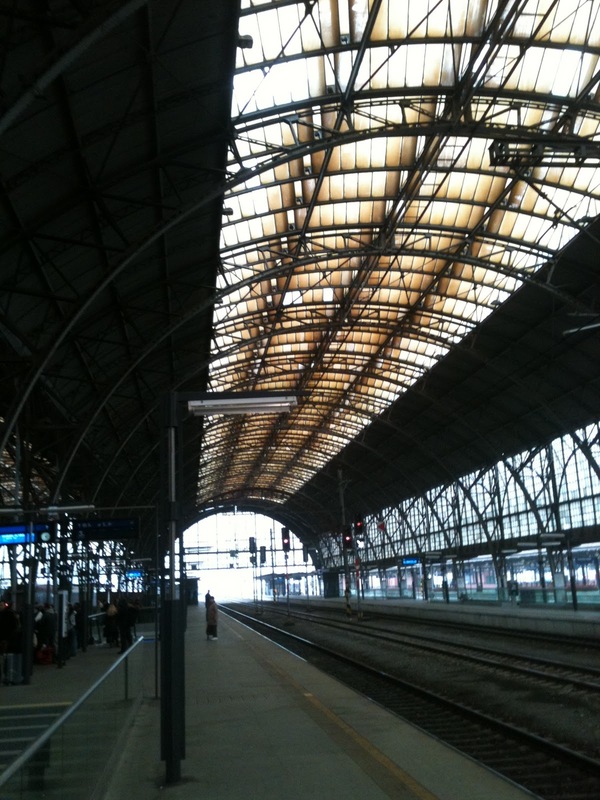 Compared with the modern architectural wonder that is the main train terminal in Berlin Prague’s station is very dilapidated and old world. Which I have to admit I liked. Those stuff soviet days are over! 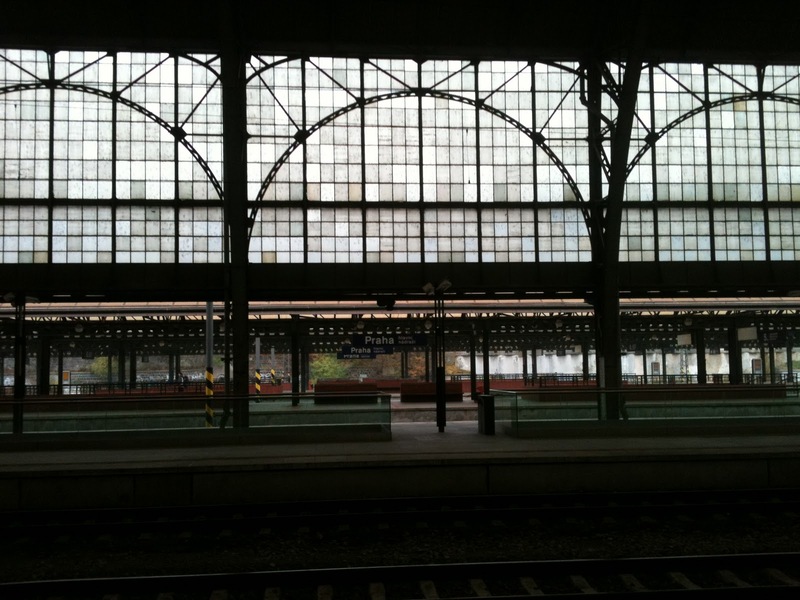 Beware taxis at the station! It’s best to go out of the station walk down through the little park and try and get a taxi on the street – knowing that a cab should cost around 100-150 to take you anywhere in town. 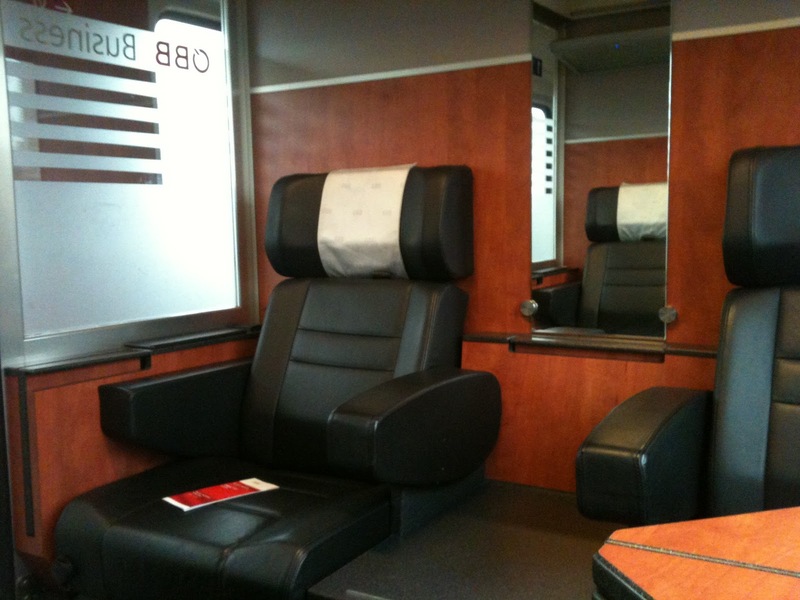 The train I got on to go back to Berlin originated in Wien (Vienna) and was a totally different experience from the German train I took there. 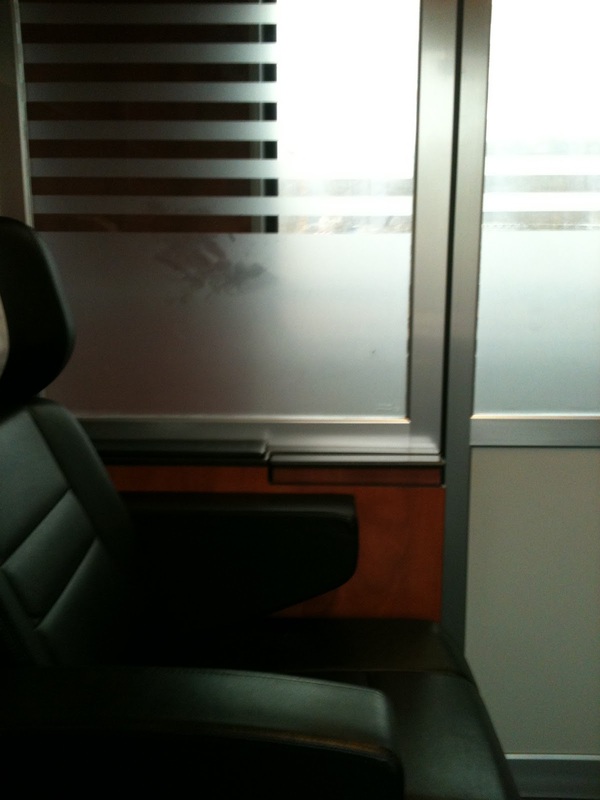 The first class compartment was all rooms with big fancy leather chairs and plugs for your laptop (no wifi tho – the phone reception on this route was very dodgy). 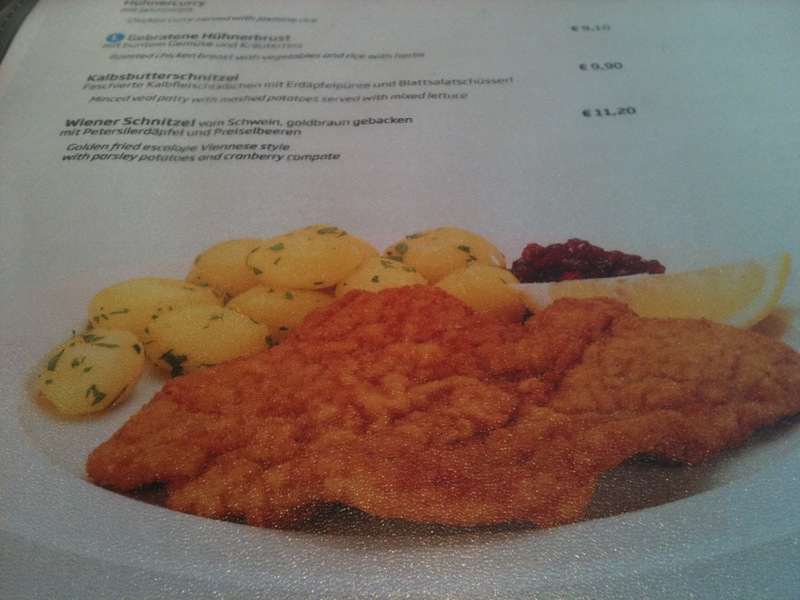 Of course given that it was a train coming from Austria it was no surprise that schnitzel was featured prominently non the menu in the dinning car. 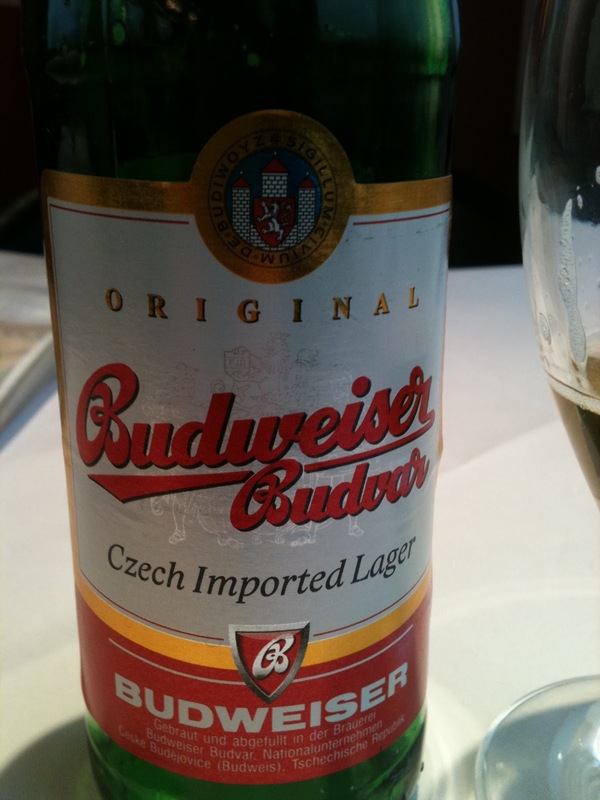 There is a huge ongoing dispute between the very old Budweiser Budvar Czech brewery and the American Budweiser one who, it would seem stole the name. Budweiser Budvar has been using that name and brewing beer since oh around the time America was founded. It also tastes way better. 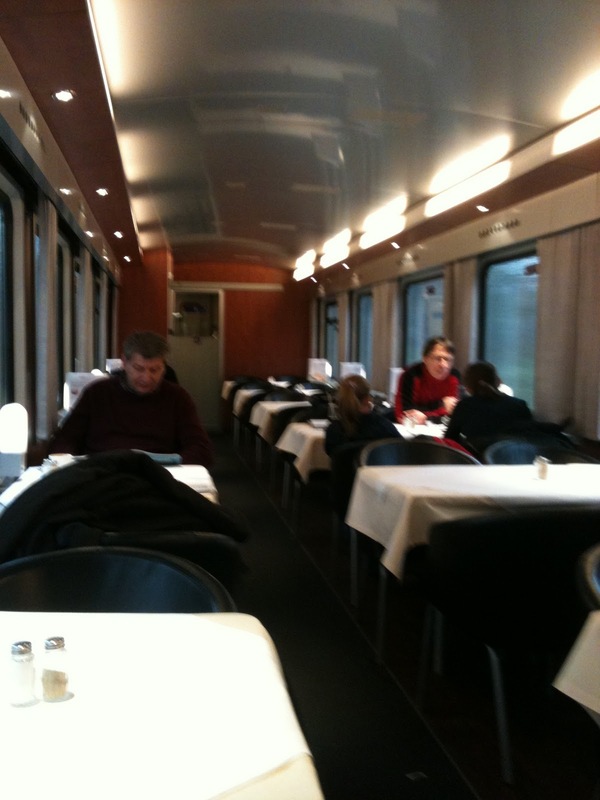 The kitchen on the tain was huge and everything was cooked to order. 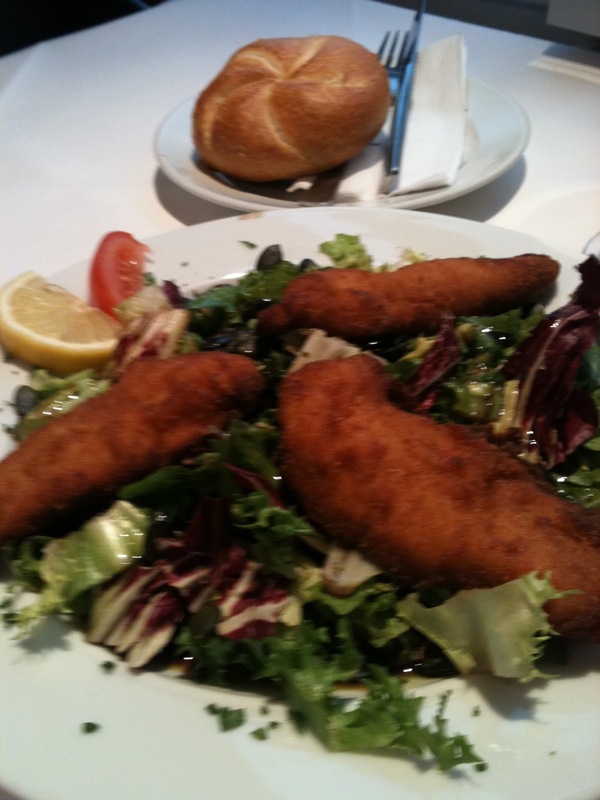 I had a chicken salad, batter fried tenders of chicken on a bed of crunchy fresh greens: delicious. 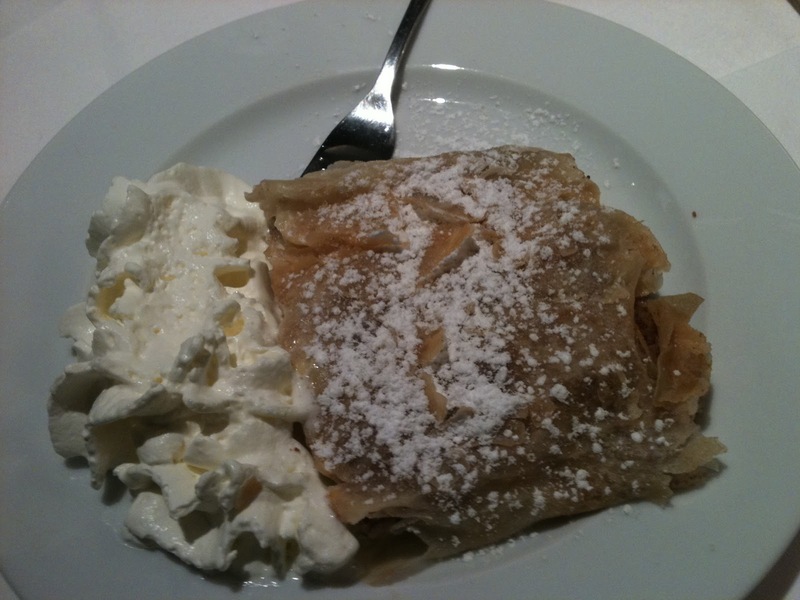 And of course how could I not finish the meal off with some Apple Strudel with unsweetened mit schlag? 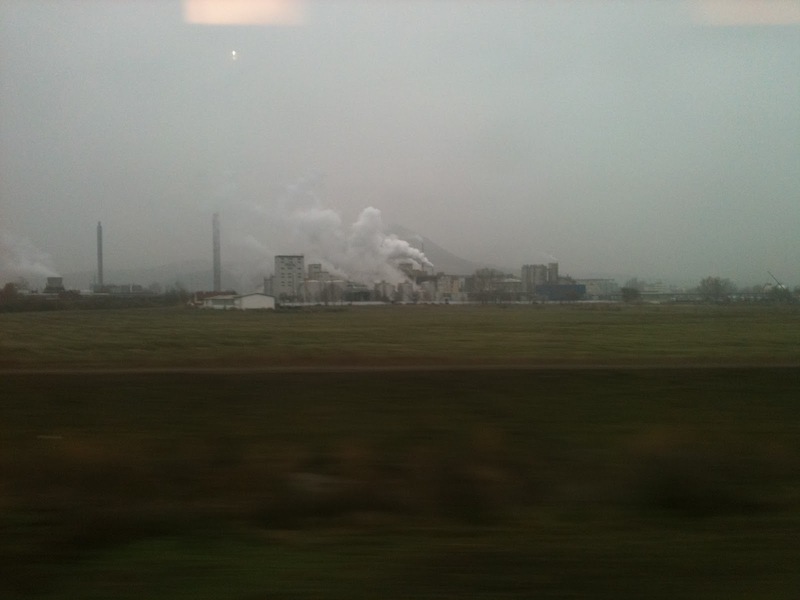 The contrast between the Czech landscape and the german landscape on this journey is quite a study in contrast. 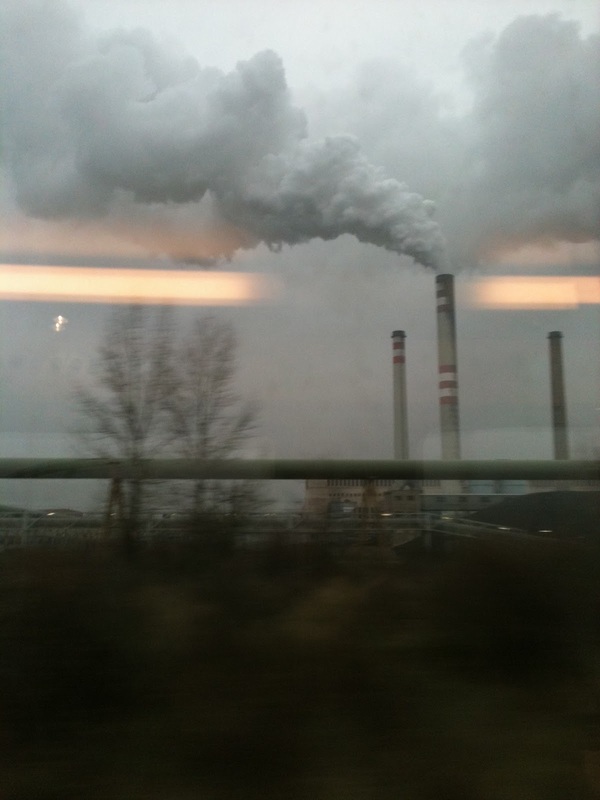 Back in Berlin with only two more nights to go….already I am wishing I could stay longer. 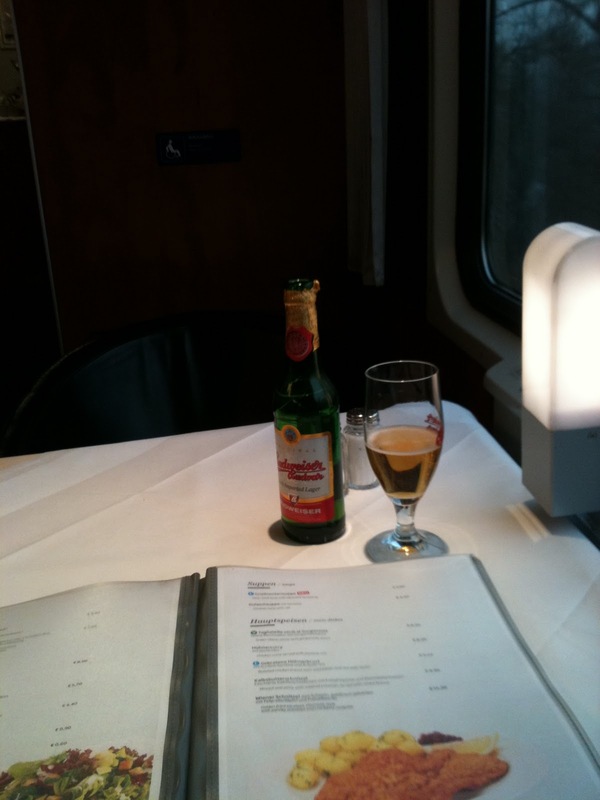 This entry was posted in Travel and tagged Berlin, Prague, Train Food, Train Travel. Bookmark the permalink.